WITH the Asian Cup just days away, we’ve heard plenty about Socceroos stars Tim Cahill, Robbie Kruse and Mile Jedinak in Melbourne, but what of their rivals? The region’s best players have touched down in Australia, ready to aide their nations’ push for Asian supremacy when the tournament kicks off on January 9. Here are 10 stars set to shine at the Asian Cup. Honda isn’t just Japan’s main man, he’s probably the best player in Asia. At 28, the midfielder is at the peak of his powers and has flourished since moving to Italian giants Serie A. The playmaker’s pedigree is impressive, having played in two World Cups and as a key part of Japan’s 2011-Asian Cup winning team, named the player of the tournament four years ago. His speed, close control, vision, finishing (he has 28 goals in 65 national team appearances) and passing ability makes him a nightmare for defences, while the blonde-haired wizard is also a dead-ball wizard. An excitement machine, expect Honda to purr for the tournament favourites. 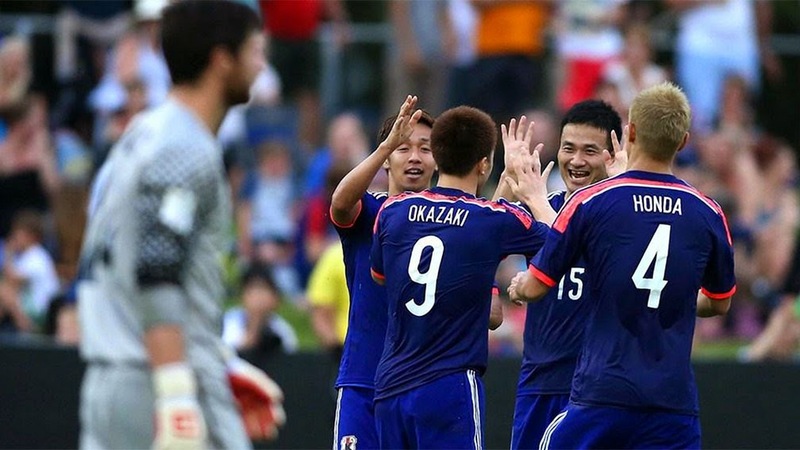 Such is the class of the Japan squad, we felt it pertinent to include two members of the Samurai Blue, Shinji Kagawa just edging out Bundesliga rival and Japan’s all-time leading goalscorer Shinji Okazaki of FSV Mainz 05. Kawaga’s club form at present reflects that of struggling Borussia Dortmund, but the Asian Cup gives the 25-year-old the perfect stage to display his immense talents. He’s yet to find the back of the net under Japan coach Javier Aguirre, but having been moved back to his ideal central role after a fruitless spell on the left, you’d expect that to change when Japan’s defence kicks off against minnows Palestine on January 12 in Newcastle. An attempted headbutt and spit at Matthew Spiranovic in the Asian Champions League final in November followed by last week’s altercation with a fan in Geelong have ensured Al-Shamrani will be the Asian Cup’s pantomime villain. His fiery nature means he’s never far from the action, but the Saudi Arabia striker is quite the player, his 10 ACL goals for Al Hilal helping him win the AFC’s player of the year award. It will be interesting to see and hear the welcome fans give him in Brisbane for the Saudis’ opener against China. A teammate of Robbie Kruse at Bayer Leverkusen, South Korean winger Son Heung-min is a genuine star and has flourished since moving from Hamburger SV. His five goals and two assists in 16 Bundesliga games this season have attracted interest from England, with Manchester United and Tottenham among his admirers. At just 22, Heung-min has a long career ahead of him, and if the South Koreans are going to upset Australia in Group A and go deep into the tournament, the winger will have to be at his best. Iran attacker Dejagh played for Germany at youth level, was part of Wolfsburg’s 2008-09 Bundesliga-winning team and played in the Premier League with Fulham. In 2011 he pledged his allegiance to Iran, scoring twice on debut against Qatar in a World Cup qualifier. Now plying his trade for Al-Arabi in the Qatar Stars League (who paid Fulham a reported $12m to sign him), the lightning-fast attacker has the talent to wreak havoc on Group D rivals Japan, Iraq and Palestine if they give him too much space and time on the ball. Dubbed the ‘Maradona of Qatar’, and for good reason, Khalfan Ibrahim has a penchant for the spectacular. The Al Sadd winger was named Asian Player of the Year in 2006, aged just 18, and while his career ascent has somewhat levelled, the 26-year-old is still a deadly proposition. Ibrahim scored goals for fun (15 in 21 games) in the 2008-09 Qatar Stars League and won the Asian Champions League in 2011. Ghoochannejhad, nicknamed Gucci, scored Iran’s sole goal at the 2014 World Cup in Brazil, and will lead the line for his country at the Asian Cup. The Charlton striker boasts a great strike rate for country (11 goals in 19 matches). Ghoochannejhad was a talented violinist as a child and will be hoping to strike a chord at the Asian Cup. Another of Asia’s genuine superstars, the only doubt over Abdulrahman is his fitness, because if he is on song during the Asian Cup, look out. The 23-year-old Al Ain attacker trialled with Manchester City in 2012, with only work permit issues scuppering his move to England. There are question marks over his condition, having not played since the semi-finals of the Gulf Cup in November, but the big-haired attacker is a big game player and the UAE will be looking to him to help get them through a wide open Group C against Iran, Qatar and Bahrain. Oman goalkeeper and skipper Al Habsi only arrived in Australia on Sunday, meaning he won’t have much time with the team before their Asian Cup kicks off against Korea Republic in Canberra, the city the Red Warriors have based themselves in. There’s plenty of experience in Oman’s squad, and Al Habsi is no different, having played 92 times of the national team, been to three Asian Cups and representing Wigan in the Premier League. The Socceroos attackers will have to be on their game when they face Al Habsi on January 13 at Stadium Australia, the 33-year-old has showed before he’s tough to get past. A two-time Asian player of the year (2008 and 2011) Uzbekistan forward Djeparov has been skipper of the side since 2011 and scored twice at the White Wolves’ semi-final finish at the last Asian Cup. Now at Korean side Seongnam FC, Djeparov’s country will look to their skipper to provide the goals in another wide open group featuring the Uzbeks, Saudi Arabia, Korea DPR and China.